the manual pdf is dated from 1992.
al might well have been predicted. Certainly, the E-mu badge should come as no surprise to anyone; this is a natural progression from their excellent Proteus range - or, more accurately, from the Proteus XR range, as the standard Proteus only had 4Mb of sounds, as opposed to the XR's eight. First of all, let's look at the instruments they've chosen to include. Really, this must have been a bit like selecting an all-time great football team; though there may have been a general consensus for some inclusions, no two people are ever going to agree exactly. What would you have included (and excluded) if it had been you making the selection? Personally, I would have opted for the Yamaha CS80, Roland MKS80 and VCS3, and might have been tempted to leave out the Farfisa, Fairlight and DX7 on the grounds that two of them aren't analogue, and all three are easy to copy with a lot of readily available and cheap equipment. I think I might also have been tempted to put in more than the single Memorymoog sample and maybe a touch more Chroma. But I'm not complaining about E-mu's choice; the selection of keyboards is excellent and with its internal memory expandable up to 16Mb there's room in Vintage Keys for polysynths such as the CS80 and more of the Memorymoog and Chroma - as well as some of the great monosynths such as the Odyssey, the OB1 and Oscar. These may well be added in due course. Perhaps the strangest omission is that of any Emulator sounds - or, come to think of it, of anything from the early E-mu modular systems, especially given the slight American bias to the selection. The other rather puzzling thing is the question of copyright and trademarks, etc. For years, no manufacturer dared to call the clavinet imitation on their synth or sampler 'Clavinet' - presumably for fear of litigation. 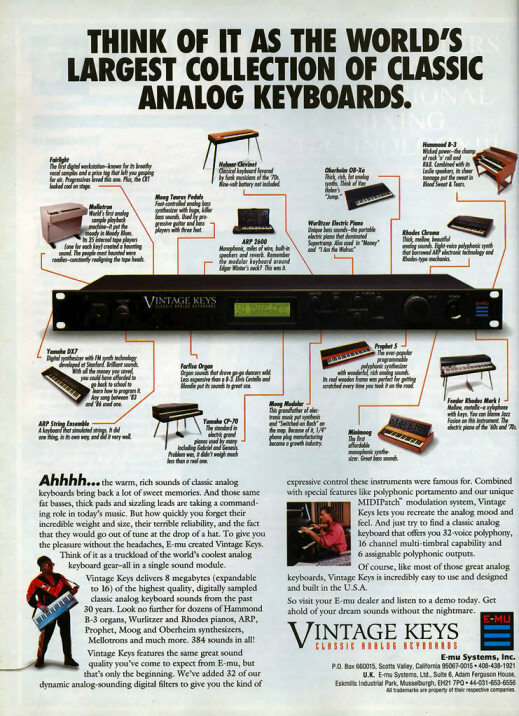 And yet here are E-mu apparently quite happy to name all the products exactly, and even have adverts with photos of the original keyboards plastered all over them. Maybe they agreed a royalty system with the trademark holders, or maybe there's no problem after all - I haven't been able to find out. The only concession to this possibly thorny question comes in the manual, which says "The names of the above-mentioned instruments may be trademarks of third parties". As you might imagine, setting up Vintage Keys is several million times easier than trying to patch together all the keyboards it is designed to replace. But clearly, for most people, it could never replace the sheer physical pleasure of playing a B3 or a CP70 - or the ease with which you can lunge at a control on a Minimoog to change a sound in an instant. So how simple does Vintage Keys make the process, and how much control can you retain, even if it's not the kind you get with drawbars, knobs or sliders? To anyone familiar with the models in the Proteus range, Vintage Keys should be reasonably easy to get to grips with. Though perhaps not quite as elegant as the Proteus range, it's just as practical - if not more so, with its much larger data entry knob and recessed power on/off button. It has the same complement of six assignable/polyphonic outputs (which can double as send-and-returns for effects), the same 16-channel, multitimbral MIDI capability - and the same 32-note polyphony. Not bad, but no less than you need when you think of all those instruments sitting in the machine waiting to be used. The unit has no onboard effects either - apart from chorus - though to my Luddite mind this no bad thing. Inbuilt effects are quite difficult not to use, and can end up giving all the sounds a certain sameness. What you do get are 32 dynamic filters - digital but producing a reasonably smooth and convincing impersonation of the real (analogue) thing. You also get polyphonic portamento - not authentic on almost all of the instruments Vintage Keys re-creates - but good fun for all that. And there's E-mu's MIDIPatch system, for interesting cross-modulation in the good old style of the Prophet 5, Matrix 12 and modular monsters. Other functions work in much the same way as the Proteus; as with any modern machine there's a fair amount of wading through menus and button-pushing, but the software is superbly organised, and works as painlessly as any I know - and a good deal more easily than most I can think of. At the risk of sounding sycophantic, it can almost be taken for granted that a new product from E-mu will be well thought out and the samples well recorded and edited (coming as they do from the Emulator III stable). But are they really representative of the instruments which are their source, and do they give you sufficient variety and control, so that you're not stuck with just one Hammond rock sound, or a single Minimoog lead? Could you take a Vintage Keys module on the road and convince someone in the fortieth row of a large hall that you had some genuine old keyboards hidden away in the wings? Could you use Vintage Keys in a recording situation confident in the knowledge that no one listening will be able to tell the difference? I listened to each of the 249 samples that are the building blocks for the sound, and the 350-odd presets that were in the review Vintage Keys module. Wherever possible I did an A/B comparison with the real thing - or the closest I've got to the real thing (like, for instance, an L100 instead of a B3, and a Multimoog instead of a Micromoog). Nearly all of the samples are squeaky-clean, and well up to E-mu's usual standard, but clearly, there have had to be some pretty significant compromises to fit this number of 16-bit samples into even as large a memory as 8Mb. When you think of the size of the hard drive or optical media you need for even a modest sample library, you'll appreciate that there has had to be some pretty drastic restrictions on multi-sampling and some very economical looping to squeeze everything in. By and large this has been done brilliantly - far better than you or I would do(?) - but some samples do suffer. Most of the Mellotron sounds, for example (with the exception of the gorgeous, evocative flute straight from 'Strawberry Fields') are only really effective over a single octave or less, and quite a number of the other samples start superbly but settle into an uninteresting loop rather quickly. The drums are also pretty ordinary, and certainly not very vintage-sounding (why no CR78 or 909 or even Simmons sounds?). The organ sounds by contrast, are magnificent - particularly the Hammonds. Whilst accepting that no one has yet produced an authentic imitation of a Leslie in a rack, these really are something special. A set of cracking major samples are supplemented with some excellent single-cycle waveforms, to give you the sort of total tonal variation that drawbars give. The downside is that you can't manipulate them like drawbars, but you have the advantage of being able to create almost any Hammond or other electric organ sound you like and make it instantly available as a preset. As for the Leslie, you can always use the real thing, with a Leslie pre-amp. I tried it and the effect was superb. I'd defy almost anyone to spot the difference in a mix. The piano sounds, too, are highly usable - especially some of the Rhodes patches - while the classic American polyphonics and monophonics produce some quite amazing presets. Though a lot of the single-cycle and harmonic waveforms are rather boring on their own, they can be combined with other waveforms or proper samples to produce the raw material that the VK modulation and filter systems can turn into great sounds. Inevitably, a number of the presets show only one facet of an instrument - the Micromoog and Arp String Ensemble, for example - but these are, without exception, well chosen. Overall, one would have to say that Vintage Keys is an absolute must for any studio - possibly the most essential piece of equipment and the best value for money since... well, something like the SPX90, or the first DAT machines - and equally useful for any professional keyboard player, even if only as a high quality back-up for the real thing. Compactness and portability have to be amongst its most compelling features: 1U of rack space compares favourably with the nine square metres you'd need for the original instruments. And reliability has to enter into it too: there's only the faintest chance of Vintage Keys suddenly giving up the ghost half an hour before a crucial session or gig. By comparison, a collection of old analogue synths is almost bound to be a source of trouble at one time or another, and getting them repaired isn't the kind of service offered by your average local music store. Affordability is another factor in the equation; while instruments like the Fairlight or the DX7 have come down significantly in price in recent years, much of the other equipment reproduced in Vintage Keys is actually appreciating in value right now, and I doubt whether you'd be able to buy the whole collection of instruments in full working order for under around £22,000. There's also the advantage of MIDI control - which, of course, wasn't an option when most of these instruments were developed. Even if a retro-fit were available for each of the keyboards recreated here, the MIDI implementation would, by necessity, be very limited, the costs exorbitant, and the risks (of allowing someone to modify these machines) higher than most people would care to take. Last, but by no means least, you have the advantage of clean, accurately pitched sound which almost certainly couldn't be guaranteed from any of the original machines without regular expert tuning, very careful siting, cabling, and, often enough, judicious use of noise gates. There are clues which will tell people who know the real thing that you're playing Vintage Keys rather than vintage keys: some of the samples are rather easier to spot than others, for example. Nor could one argue that it is absolutely indispensable. Even without going to the lengths of tracking down, buying and maintaining a huge collection of original instruments, you could do a similar job with any decent sampler by careful picking and choosing from the best of the analogue sample CDs on the market. But the big advantage with Vintage Keys is that it's already there for you; it's been done, and it's been done superbly well. All the classic sounds are there - immediately - without having to be searched for, loaded up and configured in your sampler. And the nice thing is you can edit and tweak them to your heart's content. If you're in the market for a new sound module of some kind why not take a trip back with Vintage Keys to a time when filters were expressive and drawbars reigned supreme. You might just rediscover something you thought you'd lost. Standard VKs are going out in the shops with sixty of the ROM sounds duplicated in RAM, which is a bit disappointing. But MT were blessed with a review machine which instead had sixty or so extra presets courtesy of the famous Dave Bristow and the word is that these sounds (or variations on them) may well appear on UK VKs soon. These extra presets are also organised rather better than the factory ones. For some reason, someone at E-mu decided to arrange the factory sounds into a system where all the basses end in 8, all the lead sounds end in 6 - and so on. Not a good idea in my opinion. Much better to do what Dave Bristow has done with his presets and group together, for example, all the Mellotron or Hammond sounds.